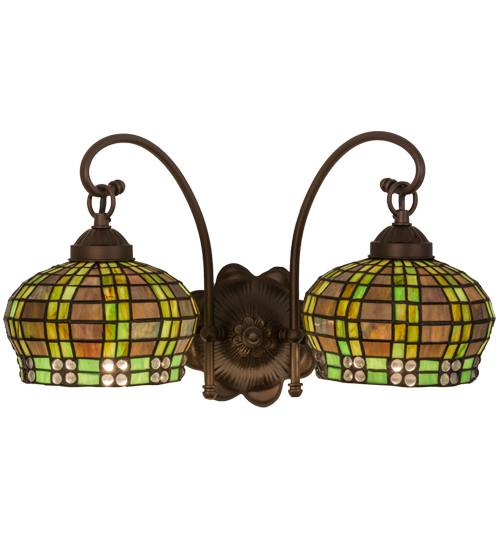 Description: Like a beautiful little basket lantern, this charming globe shaped shade of Amber Mauve and Bronzed Green edged art glass in Clear glass jewels, is suspended from the arm of a wall sconce. The hand crafted Tiffany style shades, created using Meyda's famous copperfoil construction process, is complemented by the hardware which is hand finished in Mahogany Bronze. Custom sizes, styles, colors and dimmable energy efficient lamping options are available.